17:Welcome to our Web Page, First Off….All males age 12 and above, You’ve invited to assist with set-up for events at the life center. Remember, Jesus was only 12 years old when he started his mission. You are not too young! Feel free to let me know what you think (Bro. Casey). 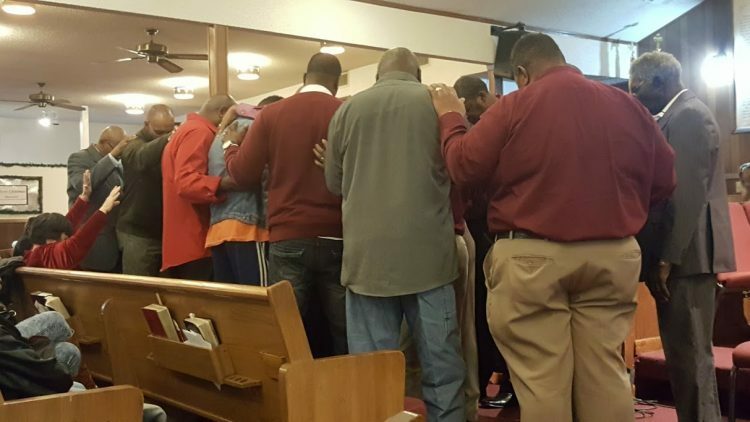 The Mount Pisgah Baptist Church “King David’s Ministry” will have a “Men’s Prayer Breakfast,” March 30th, 2019, from 8-10 AM, (Held at the Curtis A. Green Community Life Center, 1017 Ray Road, Jacksonville, AR). Members, please sign the Prayer Breakfast Form in the Church fellowship hall, this Sunday morning. Be sure to add the number of guests that will attend the breakfast with you! For more information, call 501-982-6215; or email: info@mtpisgahjville.com. Please pass the Word. Our Ministry will be preparing for the MPBC Annual Church Picnic. TBA! The Mount Pisgah Baptist Church will have the annual Church Picnic ~ in the rear of the Curtis A. Green Family Life Center. The Mount Pisgah Baptist Church King David Ministry (Men’s Fellowship) is anchored in scripture, specifically 1 Peter 2:17 that says “Honour all men. Love the brotherhood. Fear God. Honour the king.” It is also anchored in its love of Mount Pisgah, and our pastor. Our Men’s Fellowship is a group of men who enjoy each other’s company and work together to achieve common goals, here at the church, or outside of the four walls of the church. The King’s David Ministry is comprised of fathers, brothers, husbands and friends from all walks of life who bring an incredible wealth of knowledge, skills and expertise to achieve amazing things for Mount Pisgah and the community. Building the church and community – Our ministry supports the vision of the church pastor, and participates in numerous activities throughout the year. Although the activities often focus on the MPBC family, many of them are also open to the broader Jacksonville community. The annual Community Out-Reach program, which focuses on spreading the Gospel, and saving lost souls. Church’s annual Picnic event, which is held on the church campus on the 4th Saturday in the month of August. Our ministry plays a significant role in preparing the food, set-up & tear-down of tents, games, and etc. How great is it to have men who cook! The ministry handles all out doors maintenance activities to maintain the church grounds. There are three teams set to handling this important tasks to keep MPBC beautiful. Assist each Ministry of the church in their scheduled services, programs, and events. Assist the Youth Ministry in the annual Fall festival, which is in October. On Saturday the men sponsor programs for young men. Assist shared with the congregation at harvest time. When: 1st Tuesday evening of the new month. 6:00 pm for the Executive Staff, and 7:00 pm for the members. If you have questions or just want to talk, feel free to contact Bro. Cook, and Bro. Casey, Dea. Piggee or Dea. Fauntleroy.